ATLANTA — Technical and maintenance professionals play an important role in shaping the trucking industry’s image, according to American Trucking Associations President Chris Spear. Spear, delivering remarks at ATA’s 2019 Technology & Maintenance Council annual meeting March 19, characterized the trucking industry as one that steps up to the plate when times are difficult. For example, he said trucks are queued in Omaha, Neb., waiting to take food and water to communities that have been impacted by the devastating floods that have saturated the Midwest over the past several days. Spear emphasized the need to amplify the vital role of trucking industry representatives, from drivers and technicians to shippers and warehouse workers. 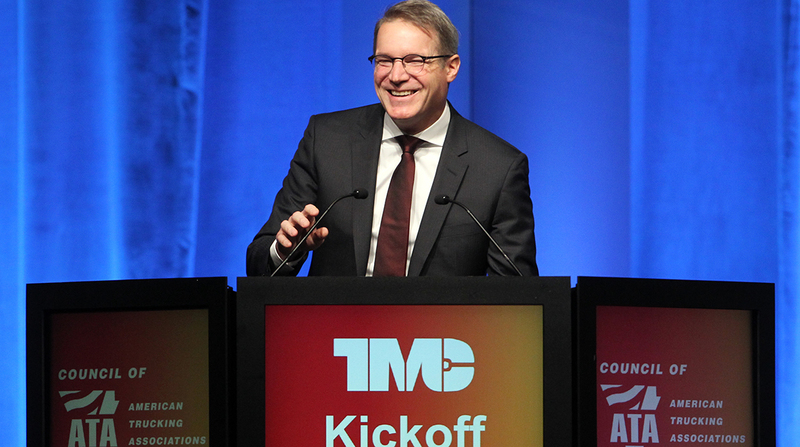 TMC develops recommendations for fleets regarding equipment maintenance. The group also conducts surveys for members of the industry and facilitates cooperation among designers, manufacturers and transportation companies. The theme of this year’s show is “Beyond the Frontier of Maintenance,” which Spear said reflects the industry’s need to peer beyond the hood and address issues that loom on the horizon. One major issue is workforce development, which is needed to offset the industrywide driver shortage. ATA estimates that the industry is short at least 50,000 drivers, and that number is expected to climb as older drivers retire. Spear praised the recent bipartisan support garnered by the Developing Responsible Individuals for a Vibrant Economy, or DRIVE-Safe Act, which proposes a two-step program for prospective young drivers to complete once they obtain a commercial driver license. The idea is to make trucking opportunities more accessible for 18- to 21-year olds, who are prohibited by federal law from driving Class 8 trucks over state lines. Noting that his son and daughter have committed to serve in the U.S. Army, Spear said that young people can be trained to operate heavy machinery, including trucks, and can offer an untapped talent pool. Spear also identified urban residents, minorities, women and veterans as candidates who could help address the driver shortage. Another goal is securing a federal infrastructure deal. Spear testified before the House Ways and Means Committee on March 6, urging lawmakers to find a viable source of funding. Spear said infrastructure legislation is expected to materialize in the next two months. He said the deal could help alleviate bottlenecks that snarl freight and commuter traffic every day. The American Transportation Research Institute reports that congestion cost the trucking industry $74.5 billion in 2016. Spear said ATA leaders rely on TMC’s research and data to develop policies and steer advocacy efforts. He urged the two groups to continue collaborating as the industry addresses issues on the horizon.